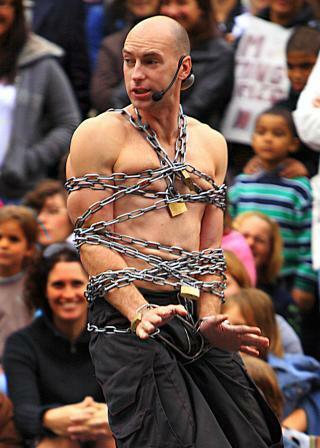 Rob Roy Collins - the Houdini of the 21st Century has entertained around the world includin Europe, Japan, Australia and New Zealand. He's been seen on TV and at Festivals everywhere ! Rob Roy Collins combines Comedy and Escapology with Acrobatics. There is a perfect blend of laugher, danger and excitement with improv and quick witted remarks both from and to the audience. The blend of stunts and slick comedy make this a well-polished act which can be performed on stage or in an adhoc space with minimal technical requirements. Rob's Stunt Comedy Escape Show is ideal for a whole range of indoor or outdoor events, from Celebrations to Corporate Entertaining and can be tailored according to the venue and occasion, lasting from 10 to 40 minutes. Rob is available for bookings as a Compere / MC, and as a Comedian/Entertainer who knows how to work a crowd, he make a great host for any event.